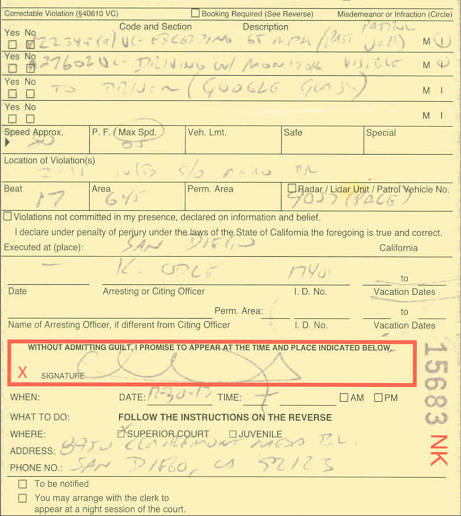 "A cop just stopped me and gave me a ticket for wearing Google Glass while driving!" said Cecilia Abadie on her Google+ page. "The exact line says: Driving with Monitor visible to Driver (Google Glass). Is #GoogleGlass ilegal while driving or is this cop wrong???" Abadie insisted her Google device wasn't switched on when she was pulled over by officers for speeding through San Diego at 65MPH. California cops are notoriously strict about driver distractions, and woe betide anyone caught using a mobile phone without a Bluetooth headset while cruising the freeways. But there are significant legal ambiguities in the rules on driving while viewing a "monitor". Certain types of device are specifically excluded from the rules – chiefly GPS screens, media players, satellite radio systems, and display panels that are built into the car. Whether Glass, which projects images into your eyes, can be counted among these – it's perfectly capable of displaying GPS information, for example – is something lawyers will have to figure out. "Explorers [people who wear the goggles] should always use Glass responsibly and put their safety and the safety of others first," a Google spokesman told The Register. "More broadly, Glass is built to connect you more with the world around you, not distract you from it. It’s early days for Glass and we look forward to hearing feedback from Explorers and others in advance of a wider consumer launch next year." MWC18 And why was Microsoft tucked away in startup event?